1. 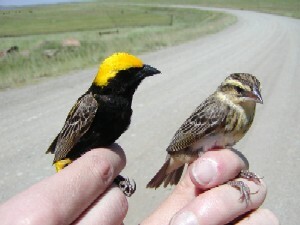 Weaver Wednesday is a new series started in June 2012 to describe each weaver species on a weekly basis, focusing on distribution, subspecies, and breeding records. This is part of the Animal Demography Unit daily series to describe species biodiversity. On the ADU home page you can read a story daily in this series, as follows: Weaver Wednesday, Threat Thursday (a threatened species), Stats Saturday, Frog Friday, Snake Sunday, Mad Mammal Monday, and Tree Tuesday. If you missed the previous Weaver Wednesday items, find a listing on the Weaver Species page: click in the last column to see the news item for those species already covered - the WW number shows the sequence in which the species was covered. 2. Weekly Weaver Paper will provide details about an interesting paper featuring weavers. This has been an irregular news item, but will now run regularly on Mondays. It will feature a recently published paper, or else a key paper published in the past. It may also be a book or field guide in which weavers are listed. An abstract and/or comments will be provided. If you have recently published a paper about weavers, please let me know! See previous announcements of weaver literature here. Other than Mondays and Wednesdays, there will be other interesting news items to read on the weavers home page, so be sure to bookmark this page!